The inmates of a prison in Wisconsin have so far failed to mount a successful legal challenge against their being banned from playing Dungeons & Dragons. According to the article, the staff of the prison deemed Dungeons & Dragons inappropriate because "one player is denoted the Dungeon Master... [who] is tasked with giving directions to other players... [which] mimics the organization of a gang." Seems pretty silly to me. The prison banning Dungeons & Dragons, that is. I just can't see how a game like this is going to encourage gang activity. 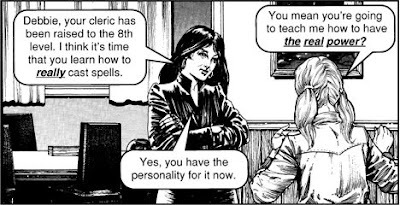 If anything, Dungeons & Dragons might be quite a productive use of the inmates' free time, since it constantly engages skills such as creative thought and mathematics. Or maybe the guards are simply afraid that the prisoners are going to use Dungeons & Dragons as a "gateway" to some legit black magick! Worth noting again that Gary Gygax, the creator of Dungeons & Dragons, was a devout Christian. Bet he wouldn't have any problem with his game being used like this. Wow, this story is a flashback to the negative hype of the 80's. I'm appalled that this mentality still exists, especially in my (former) home state of Wisconsin, the birthplace of D&D. I'm sure there are a lot more destructive things that prisoners could do to fill the empty hours other than rolling a few polyhedral dice in a cooperative group setting.